Participants in the People's Climate March, which took place in April, mobilized for climate, jobs and justice. 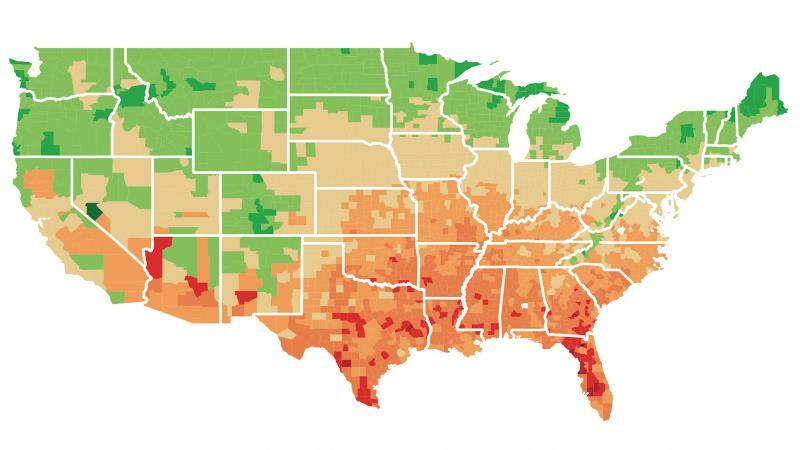 Climate change is going to cause disproportionate economic harm to parts of the United States that are already pretty hot, according to a study published in the journal Science. The study by scientists and economists from the Climate Impact Lab suggests rising temperatures could increase a national income gap. In south and southeastern states, higher temperatures mean higher costs: for electricity, crop loss, reduced worker productivity. And, for human lives. The scientists say thousands more people will die every year in southern and southeastern states because of heat-related causes. People in the Northwest, Midwest and Northeast might fare better. Mainly, warmer temperatures there might mean better crop yields. But the scientists say the overall impact on America’s gross domestic product, the total value of stuff we produce in a year, would be negative. The damage done to south and southeastern states’ economies would outweigh benefits elsewhere. The study didn’t look at potential effects of heat-related migration — like, someone moving from Florida where it’s hot to New York where it’s cooler. And researchers say they couldn’t account for how technology developments — like heat-resistant crops or cheaper air conditioning — might make the country's economy more resilient. Commissioners in Miami-Dade County and the city of Key West have voted to endorse the Paris Climate Accord, despite President Donald Trump withdrawing the U.S. from the international agreement to cut carbon emissions earlier this month. Climate scientists agree that this century is getting much warmer and that such warming will likely bring economic pain to the U.S., but economists aren't sure how much. Now, a team of scientists and economists, writing in the upcoming issue of the journal Science, says it can at least tell which parts of the country are likely to suffer the most. When it comes to water, South Florida has a lot in common with the Netherlands. Both regions are close to sea level and rely on canals, seawalls and pumps to prevent flooding. And both face an increasing threat from sea-level rise. So it makes sense that Dutch officials and South Florida leaders exchange a lot of advice on resiliency. Leaders of local governments re-affirmed their commitment to reducing greenhouse gases, unanimously approving a historic environmental resolution Monday at the U.S. Conference of Mayors in Miami Beach. The 259 mayors in attendance voted in favor of a resolution titled "100% Renewable Energy in American Cities," agreeing to set a goal of powering their communities exclusively by wind, solar, geothermal and wave energy by the year 2035.